There’s something special about cherry based smoothies and this is no exception. It’s ridiculously delicious, think ice cream, yet super nutritious. Yes, healthy food can and often does taste as good or better than its unhealthy counterpart. In my world cherries are a cherished delicacy. They’re only available at the farmers’ market for a month or two each year, and I hardly ever buy frozen fruit from the grocery store anymore. However, on a recent trip to Whole Foods I purchased a couple bags of frozen cherries with smoothies in mind. Cherries are also renowned for their anti-inflammatory properties, and are particularly effective at helping those suffering from gout or arthritis. Cherry based drinks can help with inflammation after intense exercise or physical exertion. Inflammation is at the root of many health issues. Getting enough anti-inflammatory foods like cherries into your diet can really make a difference. Cherries are just another “super fruit” that you should consume on semi-regular basis. Warning: this smoothie tastes similar to Ben and Jerry’s Cherry Garcia ice cream. Place ingredients into your high speed blender and blend for around 30-45 seconds or until your desired consistency is reached. 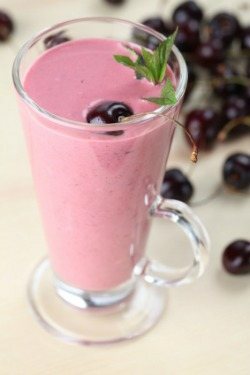 Please leave a comment below and share your thoughts on this Cherry Vanilla smoothie. Happy Blending! What an amazing smoothie! I substituted the Greek yogurt for blueberry pomegranate instead and it was absolutely wonderful! I like that endorsement, William :) Blueberry pomegranate must have put this smoothie over the top! Can I use vanilla yogurt instead and not add the vanilla extract? Is the 294 calories with the add-ons or without the add-ons? The calorie count is without the add-ons, Ruthie. My family loved this – thank you! Hi,your cherry vanilla smoothie looks really good to drink but very high in carbs and sugar and my blood sugar will be really high if I were to drink this smoothie.is there a way to cut back on the carbs and sugar in this recipe?I love yogurt,cherries and vanilla and the rest of the ingredients in this smoothie. Try using 1/2 cup cherries to reduce the sugar/carbs, but still get that sweet cherry taste. Hi,ok I will try your cherry vanilla smoothie soon and I will use a 1/2 a cup in the cherries along with the other ingredients and I will let you know what I think of it and how much I enjoy drinking your smoothie.my mom also likes drinking some of your smoothies and as soon as she hears my blender on and mixing your smoothies in it,she asks me to make her one. I just made this with regular vanilla yogurt and only added vanilla protein powder. It’s really good but the protein powder is a little over powering. You can certainly add ice and use less water for a thicker smoothie, Gina. Smoothies stay good for several hours refrigerated and several weeks frozen.